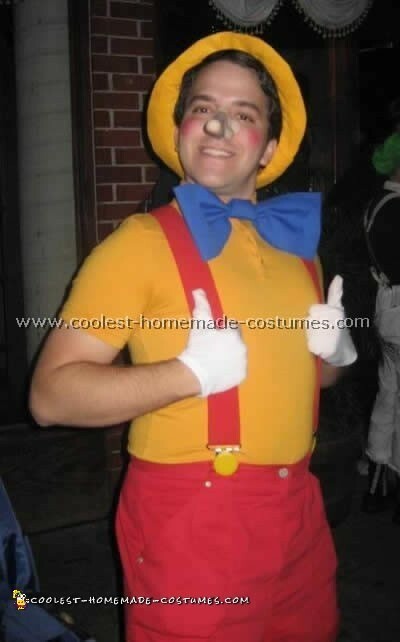 Of the many original Halloween costume ideas that I had, I thought that Pinocchio would be the best! I had the shirt but I bought the woman’s shorts at a resale shop. I made the hat out of a yellow piece of felt with blue ribbon tied around the hat, white gloves, yellow buttons glued to the suspenders and shoes. I had a nose, the boa tie I made from a small piece of blue material. The tie took about 10 min to bundle and put a couple stitches through. It was around my neck with elastic. To finish off the costume used a friend’s lipstick to make my cheeks red. Oh, but Pinocchio is a real boy! It may be Geppetto that you want to take a second look at! Here’s my son Rhett as Geppetto and Pinocchio. 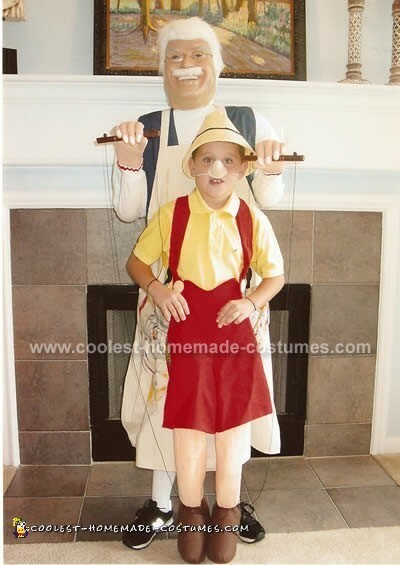 Don’t be confused, this is a one person costume featuring Rhett as Pinocchio’s top half and Geppetto’s bottom half. Geppetto’s torso was created out of a block of Styrofoam packed into a backpack and then fitted with a long sleeve shirt and yellow dishwashing gloves painted in peach for his hands. His head was simple – a Styrofoam wig holder with a Regis Feldman mask and a few added features like the mustache and white hair which we made using fun fur. Pinocchio’s overall straps are actually the back pack straps, then Pinocchio’s body is attached to that. In order to transition it all together we handmade a huge apron with paint splattered on it. Geppetto’s legs are actually Rhett’s legs. We hope you enjoy our creation and good luck with your original Halloween costume ideas.